South Korean and US intelligence agencies are reporting that North Korea has the ability to build up to 60 nuclear warheads, as the country has been secretly producing highly-enriched uranium (HEU) at higher levels than previously thought. Figures for 2016 show that the DPRK has an estimated 54 kilograms of plutonium and 758 kilograms (.83 tons) of highly-enriched uranium, according to South Korean news outlet JoongAng Ilbo. Previously, defense experts estimated that Pyongyang possessed around 40-50 kilograms of plutonium, and 300-400 kilograms of highly-enriched uranium. Producing a nuclear warhead requires 16-20 kilograms of highly-enriched uranium, and between four to six kilograms of plutonium, according to estimations from US and South Korean military experts. Around six kilograms of plutonium were used to make the atomic bomb dropped on Nagasaki during World War II. The newly installed Trump administration is eyeing an opportunity to revamp the U.S. domestic missile defense system to combat evolving threats posed by Iran, China, North Korea, and other rogue regimes, according to senior White House officials and new congressional communication disclosing how nations across the globe are “working diligently to exploit the many gaps and seams” in America’s current defenses. Congressional allies of the Trump administration’s national security vision recently petitioned the White House to allocate funds needed to rebuild and update the country’s missile defense systems, which have been beset by problems and can no longer defend against the latest missile technology. Iran’s latest test of ballistic missile technology has only reinforced the belief in Congress that something must be done to secure the American homeland, according to a team of nearly 30 leading lawmakers led by Rep. Trent Franks (R., Ariz.), co-chair of the House’s missile defense caucus. RAF top guns scrambled to intercept two nuclear-capable Russian bombers as they flew menacingly towards Britain this morning. Vladimir Putin’s Blackjack bombers flew within Britain’s “area of interest” but did not enter UK airspace. The show of sabre-rattling comes just one day after Vlad ordered his air force to be ready for a “time of war”. Five people were lightly wounded after a Palestinian man opened fire at a bus and stabbed someone near an outdoor market in the central Israeli city of Petah Tikva on Thursday evening, officials said. Police officers quickly arrested the West Bank man, who was still in possession of the gun used in the attack, a police spokesperson said. Gaza City (Palestinian Territories) (AFP) – The Islamic State group said Thursday that it fired rockets at the Israeli resort of Eilat from the Sinai Peninsula in a rare attack on the Jewish state from Egyptian territory. The Israeli army said there were no casualties from Wednesday evening’s rocket fire — three of the rockets were intercepted by Israel’s Iron Dome air defence system and a fourth fell short of the town. A few hours later, two Palestinians were killed elsewhere in the Sinai. The Islamist Hamas movement which rules Gaza said it was an Israeli air strike. The Israeli army denied carrying out any such action. Heightened security measures around the capital’s “iron lady” were put in place as early as 2012 during the European football championships. Temporary fences were installed last June, but these rather unattractive barriers will now become permanent with the placement of a 2.5 meter-high bulletproof glass wall, according to French daily Le Parisien. Russia views Romania as a NATO outpost and as a threat due to it hosting elements of a U.S. anti-missile shield, the Interfax news agency reported on Thursday, citing a Russian foreign ministry official. The U.S. military, which says the shield is needed to protect from Iran, not threaten Russia, switched on the $800 million Romanian part of the shield in May last year. Another part of the shield is due to be built in Poland. It’s estimated that power companies in Russia suffered more than 350 serious cyber-attacks in 2016, a 50 percent increase on the previous year. The Pentagon has been stripped of almost all of its political appointees from the Obama administration, but an uncertain Senate future awaits the candidates whom President Trump will nominate to remake the armed forces in his image. Of Mr. Obama’s 163 political appointees at election time, who included Senate-confirmed service secretaries, undersecretaries and assistant secretaries, only 16 remain at the Defense Department, according to a Pentagon statement to The Washington Times. The exodus might be considered normal in the transfer of power: Political appointees are required to turn in their resignations in December. But Washington’s bitter political climate is far different today from the last transfer of power in 2009. Senate Democrats are resisting Mr. Trump and his agenda via the confirmation process. There is a chance that some of the Defense Department’s 53 appointed positions requiring Senate confirmation will be vacant for a long time. The Trump administration recently imposed sanctions on Iran for its missile test, and the sanctions reveal that Tehran’s missile program is backed by covert assistance from China. The Treasury Department’s Office of Foreign Assets Control, which enforces U.S. sanctions, said last week that a “Chinese-based network” was helping procure goods for Iran’s ballistic missile program. The sanctions designated 13 people and 12 companies who were placed under the Treasury restrictions that prohibit any U.S. companies from doing financial transactions with them. The action followed a flight test Jan. 29 of an Iranian medium-range missile that failed a short time after launch. Russia’s interior ministry says it has arrested nine members of a major hacking group suspected of stealing millions of dollars from Russian bank accounts. The NATO Cooperative Cyber Defence Centre of Excellence on Wednesday released its first major revision to its influential Tallinn Manual, the closest thing there is to a rulebook for nation-led cyber operations. Like the original 2013 manual, the new version is the result of a study by NATO to gauge consensus opinions from international law experts on what types of cyber statecraft are acceptable. The US military said Wednesday that it had killed eleven Al-Qaeda operatives, including a veteran leader and suicide-bombing pioneer, in a bombing raid in Syria. The Pentagon said Abu Hani al-Masri, the Qaeda veteran, was one of those killed in the precision airstrikes near Idlib carried out on February 3-4. Russian negotiators are calling for “cultural autonomy” for ethnic Syrian Kurds in a draft version of a new constitution for the war-torn country unveiled Thursday. The language could put Russia’s tenuous alliance with Turkey in Syria in danger, since Ankara continues to identify factions of Kurdish paramilitary forces in the country as terrorist groups. Islamic radicals and far-right terror groups are becoming an increasing problem in east German provinces, a senior counter-terrorism official told German media Thursday. “We receive information on terror suspects every day,” said Stephan Kramer, the regional chief of state protection and counter-terrorism in Thuringia, a state in east-central Germany. Many Islamic extremists came to the region during the summer of 2015, when Germany faced a wave of mass migration, Kramer said. At the time, a radical group had raised red flags in Saxony for building new prayer centers with the goal of instating Sharia law in Germany. WASHINGTON – Civilians with expertise in cybersecurity could be directly commissioned into the Army with a rank up to colonel to help the service improve its expanding cyber domain operations under a Pentagon pilot program authorized in recent weeks. Canada will provide long-range sniper rifles and anti-tank weapons to the Kurdish forces fighting the Islamic State (ISIL) in northern Iraq, the Department of National Defence said Wednesday. Prime Minister Justin Trudeau announced a year ago that Canada would arm the Kurds, and DND said Wednesday the list included .50-calibre sniper rifles equipped with silencers, 60mm mortars, as well as Carl Gustav anti-tank systems. Details about the numbers of each type of equipment were withheld for security reasons. 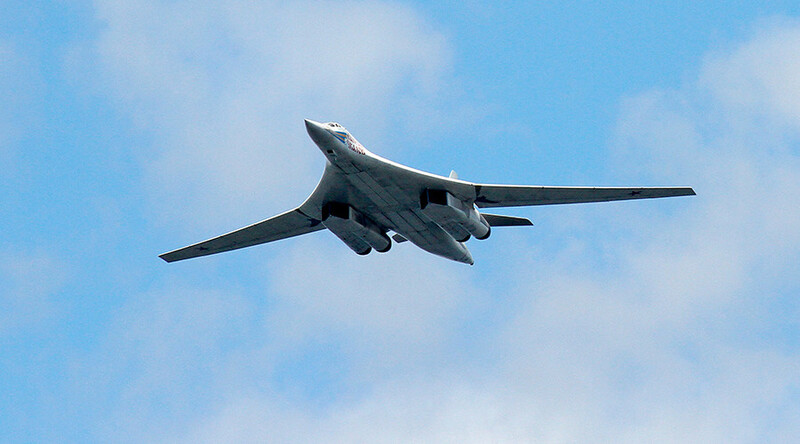 “They flew over neutral waters in the Barents and the Norwegian seas, as well as in the Atlantic Ocean,” Defense Ministry spokesman Maj. Gen Igor Konashenkov said.